54" height chrome wire add-on unit. Consists of 2 posts and your choice of 4 or 5 shelves. 63" height chrome wire add-on unit. Consists of 2 posts and your choice of 4 or 5 shelves. 74" height chrome wire add-on unit. Consists of 2 posts and your choice of 4 or 5 shelves. 86" height chrome wire add-on unit. 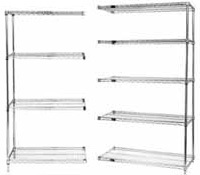 Consists of 2 posts and your choice of 4 or 5 shelves.